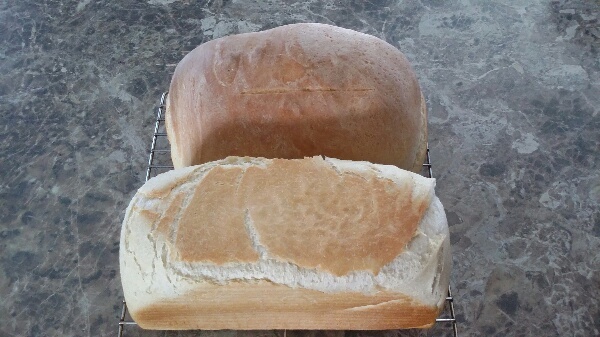 Bread seems to be perfect for one of our first blog posts. Bread is the basis of many cultures and lives, especially our own. 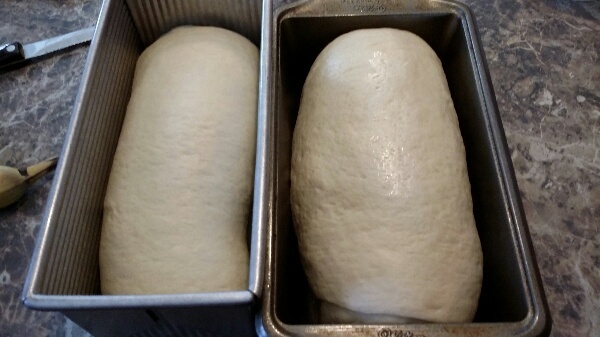 I decided a couple of years ago that I would start making our everyday bread. This is an easy recipe from a cookbook we received as a wedding present. I made it as a mistake to begin with, as I thought I was making a boule. When I finally read in the recipe while the dough rising, I realized that I needed bread pans to bake it. I knew I had made a mistake, yet the mistake was wonderful one. I have tried other recipes, but keep coming back to this one. Mix 4 cups flour, sugar, salt, butter, and yeast in stand mixer with bread hook attached. Turn on the mixer on level 2 and slowly add the warm water. Once flour is incorprated some, add in each additional cup slowly. Let the mixer knead the bread for 10 minutes until th dough is smooth and springy. Place in a large greased bowl with olive oil and clover with plastic wrap. Let rise for 1 hour until doubled. Grease two loaf pans. Gently push fist into dough to deflate. Divide dough and roll out into a 18 x 9 inch rectangle. Roll dough up tightly from the short end. Seal edges by pinching and put seal side down in the pan. Roll out second ball of dough in the same way. Cover and let rise for 35 to 50 minutes. Bake at 425° F for 25 minutes on the lowest rack. I have used this as the base for many recipes and will share those in time. You have inspired me. I am going to make bread this month. I’ve not done it since I had my grandma to help me, so you are going to be my new guru. xo.